Ocean & Marina Views From This Charming Cottage! Walk To Beach & Town. Also has two bathrooms. More pictures to come (we are just moving in!). Please note, in July & August, we only rent by the week (Fri.-Fri). In the off-season we are open to shorter rentals. Husband & wife that both grew-up going to Chatham! We loved this cottage! Not fancy however so Cape Cod! The location is what is so awesome, the outermost harbor, marina, morris island and the monomy reserve are such hidden gems and makes for a peaceful stay. Beautiful breeze from the ocean keeps house cool. Also the beds must all be new as they were heaven! The upstairs king was more comfortable than my bed at home!!! The decor was also all updated with comfortable seating. Kitchen was cute. All in all I would definately recomend this house and I love a place that doesnt have 10 pages of instructions, I think the McConnells are probably my kind of people!! And I enjoyed the wine they left for us at the house,class act!. Great place to rent in Chatham!!! My 4 kids and I stayed here for a week and are absolutely in love with this cottage. The homeowners have thought of everything. Some rentals have "rental furniture", but this cottage is furnished beautifully with plenty of seating in the living room for our evening board games and card games. The rooms are big and airy, and with all the windows open, the breeze off the ocean offers the perfect temp and air for a great night sleep. Beds are super comfy and the sheets and towels provided are really nice. The kitchen has everything you'll need, and we cooked most nights. Thanks Mike and Courtney for a wonderful stay and for all the great communication. We can't wait for next year! Beautiful cape style cottage, about 5-7 minutes walk to Lighthouse beach and right next to the marina. All necessities provided: towels, washer/ dryer, dishwasher, and plenty of space for 7 people (there are 5 beds in the house). Note that this is not the place if you expect swanky, luxurious setting with marble-inlaid baths. 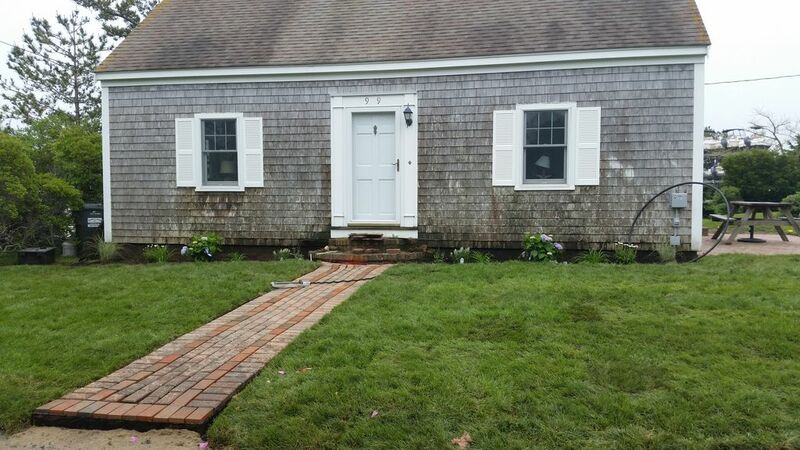 This is a typical cape-style cottage with wood paneling inside, and the charm and character that comes along with it. All in all, we had a great time at the cape, and I would recommend for a family that wants to be walking distance from Lighthouse beach. Lovely stay at a lovely cottage! From the moment we pulled up to Courtney's cottage... we felt at home. Every detail was thought of for our group of four, even though it could have accommodated so many more! From the many encoutrements in the kitchen, to all of the beach toys and chairs for us to enjoy... Courtney left nothing out! We really enjoyed every morning having the Marina at our fingertips! After riding our bikes to the bakery to pick up our favorite yummy's, we would bring them back to enjoy them with our coffee while watching the boats on the harbor. The location couldn't have been better! A couple of mornings we rode our bikes to Lighthouse beach for Yoga... and then a couple of other mornings we rode to church! The pictures don't do it justice... the vaulted ceilings in the cottage were incredibly lovely and it was decorated perfectly... thank you Courtney. We truly couldn't have had a better time. We thoroughly enjoyed our stay! The cottage had everything we needed for a comfortable stay. All 5 of us slept comfortably and with 3 showers (including outside shower) we never ran out of hot water! Very convenient location to enjoy beach, shopping and restaurants. Highly recommend!